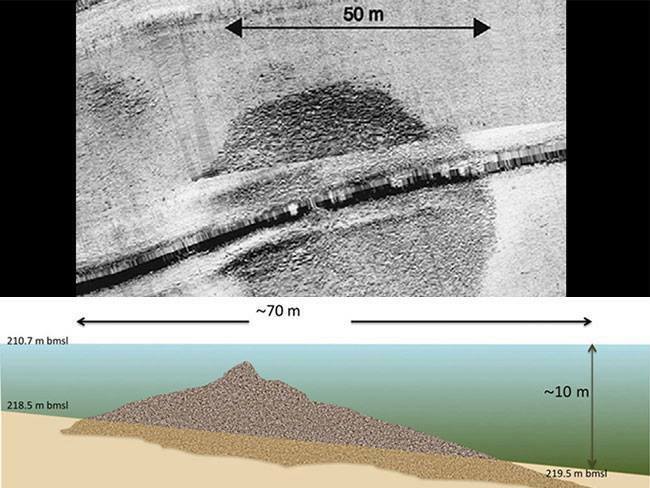 This past summer, Archaeologists in Israel discovered an enormous structure under the Sea of Galilee. A huge, cone-shaped monument has been discovered by a team of Israeli archaeologists conducting a geophysical survey on the southern Sea of Galilee. « According to a paper published in the International Journal of Nautical Archaeology, the structure was built several thousand years ago and later submerged under the water. It is 230 feet (70 m) in diameter and about 39 feet (12 m) high. The estimated weight of the monument is over 60,000 tons. “The site resembles early burial sites in Europe and was likely built in the early Bronze Age. There may be a connection to the nearby ancient city of Beit Yerah, the largest and most fortified city in the area,” explained Dr Yitzhak Paz from Ben-Gurion University, lead author of the paper reporting the discovery.